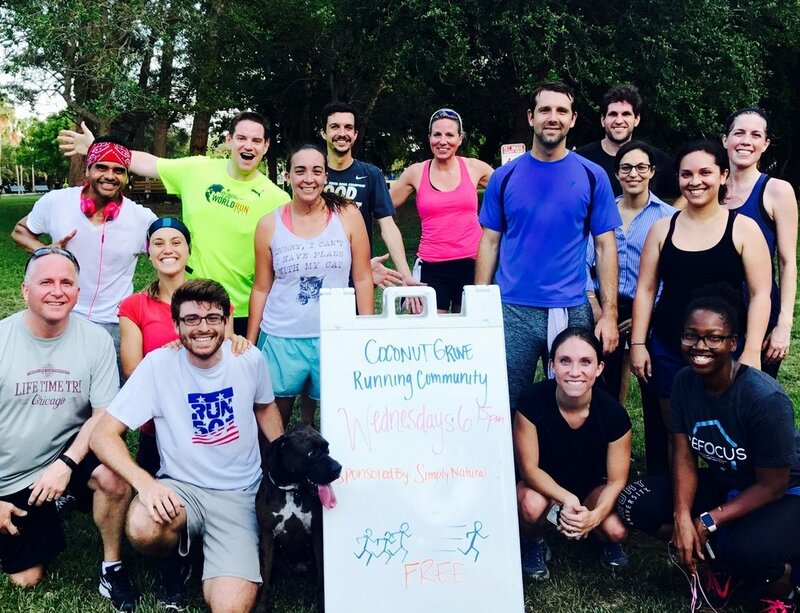 Coconut Grove Run Community truly is all about community. It was started as a way to develop community in Coconut Grove. Our heart is to encourage people of all levels to get out the door and start moving their feet with others. We want to create a safe environment for people new to running to people wanting to PR in their next marathon. We want to help people of all levels do things they never thought possible. We love supporting our local community. We meet every Wednesday at 6:30 pm for 3 miles at Kennedy Park-we meet at the north entrance where A.C.'s Icees parks. And Saturday mornings at 7am for our longer runs (4-10 miles) at the same place. We also love to help out the community. We have hosted community park clean ups and we love supporting other local charities such as the Woody Foundation. We will be running Wings for Life this May. Contact Lucy Foerster for more info. We LOVE people so our Community is FREE! Invite your friends or family and join us for a great time to get healthy with awesome people and achieve new goals. Community Wins.